This is by far, the number one killer of parental sanity during the first year! So many of my clients, in fact, I think almost every one, have this in common- baby is waking up beyond the realm of ‘normal’ for nightly feedings. And that simply is not sustainable for any well-meaning parent. So what do you do about? How do you break the habit? And why do we want to discourage bottles in the crib while falling asleep? When feedings or bottles are used as a method to fall asleep, we enter into the realm of sleep props. Essentially, a sleep prop is anything external that your child needs to fall asleep that won’t be present when they wake up. Some examples: rocking, nursing, pacifier, swinging, bouncing, back rubbing, bottles. All of these are wonderful, comforting tools in our parental toolbox to use during the day to calm and love on our children (and feed them!) but once they become a prop, most prop dependent children are going to need that exact same stimuli to fall asleep every time they end a sleep cycle at night. Sleep cycles typically are around 1.5-2 hours at night, always ending in a brief period of awakening. So that means….you’re up every 2 hours at night. Sound familiar? 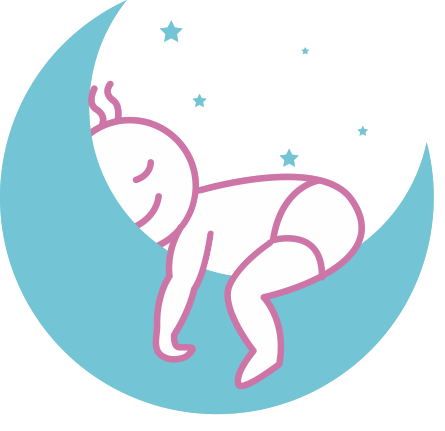 And if that sleep prop is a bottle or feeding, you’re little one is consuming a ton of calories during the night which then effects her feeding rhythms. And, for some families, this can go on for years. When you put your baby in bed at night, it’s fine to include the bottle/feeding in her routine. You could start with a bath, and then pajamas and then her bottle and a story or two. But then we need to make sure that the bottle or nursing session ends before she falls asleep. Not doing so makes it really tough for her to work on her sleep strategies. And of course, falling asleep with a bottle in the crib can be very damaging for her teeth! If your little one is over 6 months and gaining weight well, you are likely able to safely drop those night feeds all together. There are a number of different sleep coaching methods to help you get there. The Sleep Sense Method is what I trained under and used for both my kiddos- click here (and then click on the Sleep Sense link) to purchase the book, which gives a really great step by step guide on how to do this and will set you up for success. If you’re little one is under 6 months, then I encourage you to just give pause each time she wakes at night. Sometimes, we end up going to our children a little too quickly and if we give them a some space, they will actually put themselves back to sleep. So whether that’s 2 minutes, 5 minutes or 10 minutes or whatever time you’re comfortable with, you will be helping to discourage extra night feedings by just giving her a little time before going to her. If cutting feedings cold turkey feels too stressful, then you can slowly wean them by decreasing the amount of ounces (if bottle feeding) or feeding duration (if nursing) at night. This takes longer and still will require you to end it at some point, but may be more comfortable for your family. There’s no easy and quick way to end those night feedings if it’s become a habit for your child. There will likely be some tears, but if they really are not needing calories during the day, then it doesn’t seem fair for our children to have to wake up so frequently for something that is not necessary for them. In the end they’re the ones who are sacrificing sound, solid sleep, and of course you are too.